It was just yesterday that leaked shots of the Pentax K-01 turned up, and now here's the full monty. It's not what you might call a head turner, but it's a pretty impressive addition to mirrorless cameras. 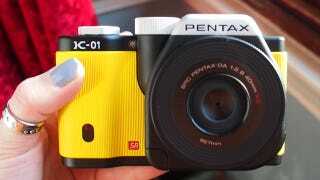 Is This the Mirrorless Pentax K-01 in These Leaked Photos? The biggest deal with the K-01 is that the K-lens mount is compatible with any Pentax lens out there, so unlike other systems, you don't gotta buy all new lenses. The rest of the guts include a 16.28MP APS-C sensor—the same spec as the much-respected Sony NEX-5N—a 920,000-dot 3-inch LCD, 1080p h.264 video at 30fps and 720p at 60fps, 6fps burst mode, and ISO from 100-25600. Based on how APS-C sensors in Sony's NEX line perform, the K-01 should provide really good low light performance. It's also got Pentax's shake and dust reduction system. Our old friend Kat Hannaford at Gizmodo UK got a chance to go hands on at the launch event today (click through for more shots and her thoughts). She wasn't too taken with fellow Aussie Mark Newson's design of the aluminum-bodied camera, but came away plenty impressed with the performance, especially the new DA 40mm XS lens, which Pentax claims is the thinnest interchangeable lens ever.